We will make your event an unforgettable one. We specialize in Weddings, Quinceaneras and Birthdays. Our TWO Ballrooms were both recently renovated with many amenities. Ballroom A (200 capacity) is 4000 SF with a TRADITIONAL theme. Ballroom B (300+ capacity) is MODERN with a black and white theme and the latest LED light technology. 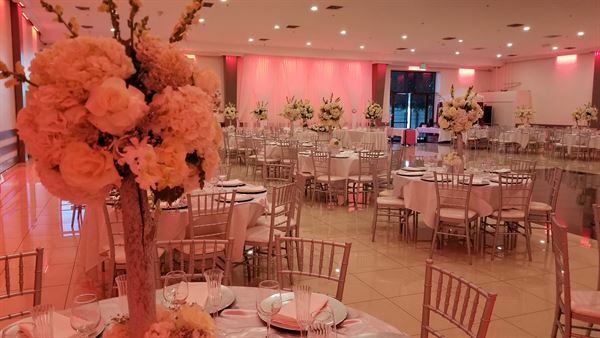 Our complete package includes the dance floor, stage, tables, chairs, linens, covers, center pieces, china plates, silverware, Food (Mexican, Italian, American), soft drinks, food servers, cleaning crew and management. We do allow outside catering with prior approval. We include Ballroom A with up to 200 chairs, tables, linens, covers, Food (Mexican, American, Italian), Soft drinks, ice, china, silverware, napkins, charger plates, waiters, cleaning, security and management. This package is first come first served. Not all dates are available. There is extra charge if the date falls on Federal Holidays. Alcohol, Music and Cake are NOT included. There may be additional charges for extra personnel, parking, bartender and security deposit. We have TWO ballrooms to serve you. Ballroom A is 4000 SF with 200 occupancy with a Traditional theme. Ballroom B is 6500 SF with 325 occupancy with a Modern theme. Both were recently renovated, including brand new bathrooms, ceiling, fire safety and LED light systems. I hosted our family reunion party here at ANGELENO BANQUET HALL on January 18, 2014. The price was reasonable and fits my budget unlike other halls that's so expensive. The venue was nice and clean. The crew were professional, courteous and flexible. They let me CHOOSE from the menu, unlike other hall you don't have any options. The food was fresh, delicious and tasty. They even allowed us to bring our traditional roasted pork (Lechon) without Corkage Fee. Whatever left-over food they will give it to you and even assist you to put it in alum tray and I end up having food for almost a week ("cool" so I don't have to spend and cook). We enjoyed the party all night and danced the night away. I will definitely do my party to this hall again and again. I will recommend this hall to my family and friends without any hesitations!! THE PRICE WAS FAIR. THE MANAGEMENT WAS HONEST AND HELPED US WITH PLANNING AND MAKING SURE EVERYTHING IS AS PERFECT AS POSSIBLE. GOOD SIZE DANCE FLOOR. COURTEOUS STAFF.